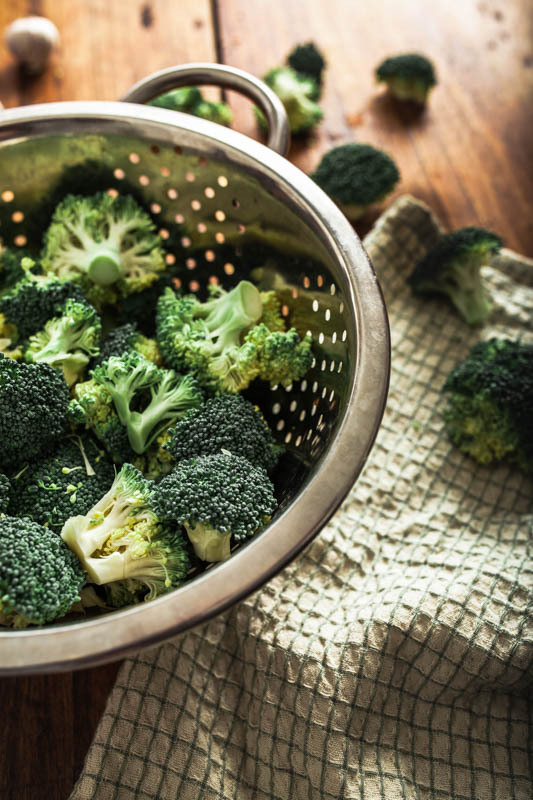 You would like to gently steam your vegetables, but are absolutely not up to finding a new spot in your cupboards for yet another bulky kitchen device? Well, then why don’t you try it with your good ol’ pal the kitchen strainer? Toaster, water kettle, blender, food processor, sous vide, slow cooker, hot air fryer, bread machine, vacuum sealer, juicer, smoothie maker, centrifuge …. I could go on with that for hours. There are hundreds of thousands of kitchen machines that are supposed to make our lives easier. Yet, if we’re being totally honest to ourselves, we’re not even using half of our gear on a regular basis. Most of those machineries carve out a miserable existence in our cabinets, waiting to be at least used once or twice a year. I want to be fully honest with you. I don’t even have a kitchen. I only have a cotchen. I have a corridor kitchen. Once you enter my sweet little apartment you stand in the corridor. AND in the kitchen. Simultaneously. I am definitely not one of those people who have a square meter to spare. Or who doesn’t know how to possibly furnish the west wing of my ridiculously noble mansion in South France. I am one of those peeps who simply don’t have space for the nth kitchen device that serves exactly one single pathetic function. 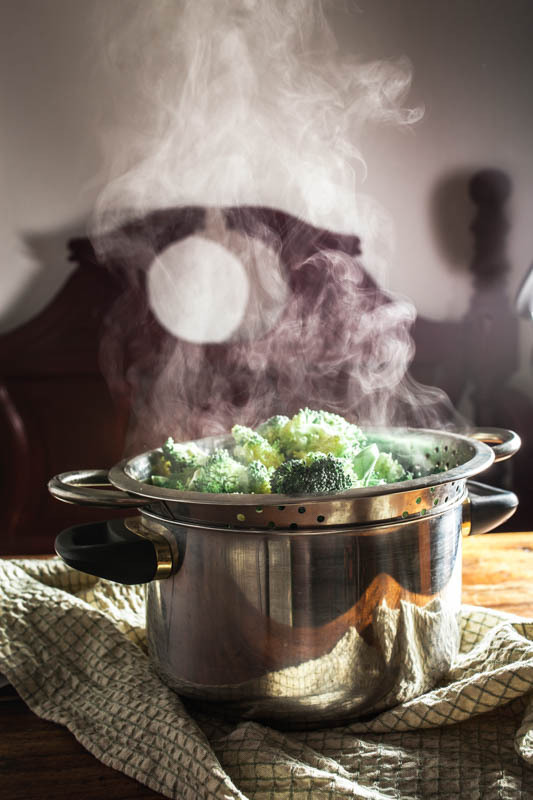 So, for all of you who can relate here’s a neat little kitchen hack to steam vegetables without a steamer. Steaming does simply mean boiling with water vapour. 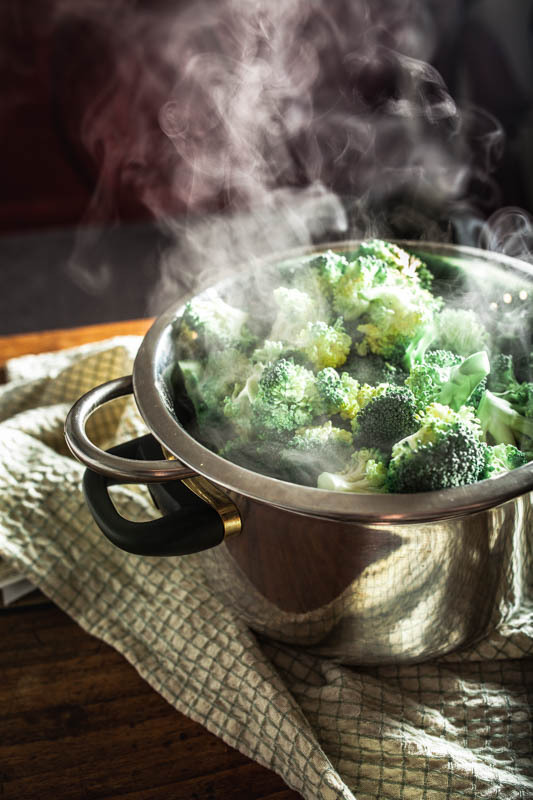 So if you don’t steam veggies all too often, it’s not worth getting a steam cooker or a bamboo steamer. A pot and a strainer suffice for great results. You just fill the pot to a about a quarter with water and bring it to a boil. Then you just put the strainer with your cleaned and chopped veggies on top. Additionally you might want to add the lid to prevent the vapour from escaping. Depending on which vegetable you’re steaming and how crisp or soft you’d like to have it (and how fully you’ve stuffed your strainer) the cooking time varies. 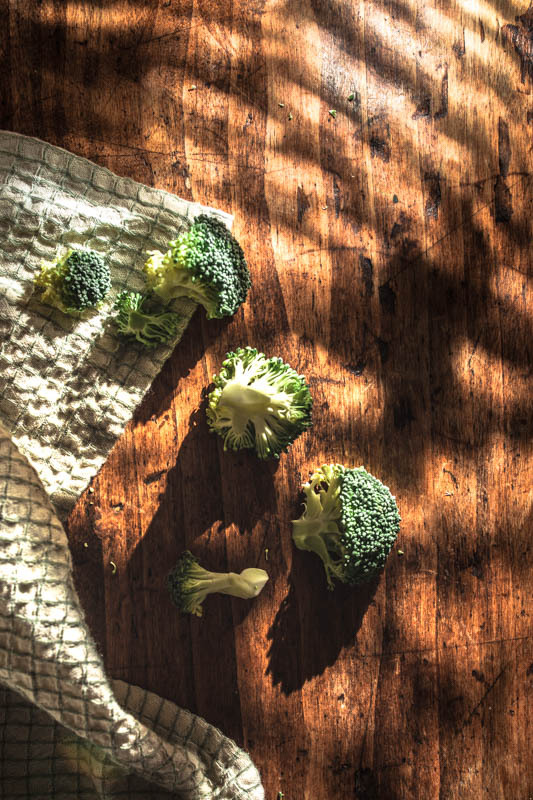 The broccoli e.g. took about 5-7 minutes to become al dente and about 10 minutes to a soft and tender texture (perfect to make a soup from it). This steam method by the way can be perfectly combined with cooking other ingredients in the boiling water such as pasta, rice or potatoes. This does not only save energy but also your time. 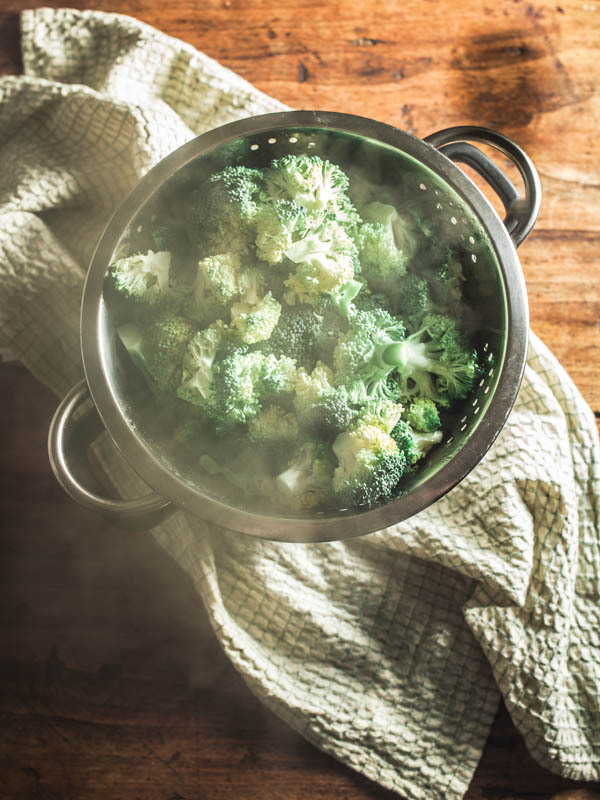 However, steaming is not solely meant for cooking your veggies. You can also steam dishes such as dumplings / gyoza / pierogi or the sinful sweet dish from Austria called ‘Germknödel‘ a yeast dumpling filled with plum sauce. Also, steaming meat and fish makes them extra tender. I admit it, I allowed myself the luxury of owning a *rice cooker. It’s just too practical to just turn on this device and let it cook the rice all by itself. My rice cooker had a steamer-cap included, which allows me to steam veggies parallel to cooking the rice. So if you’re currently looking for a rice cooker you might want to check if it has that little gimmick included. The steaming method is a much gentler way of cooking than using boiling water. 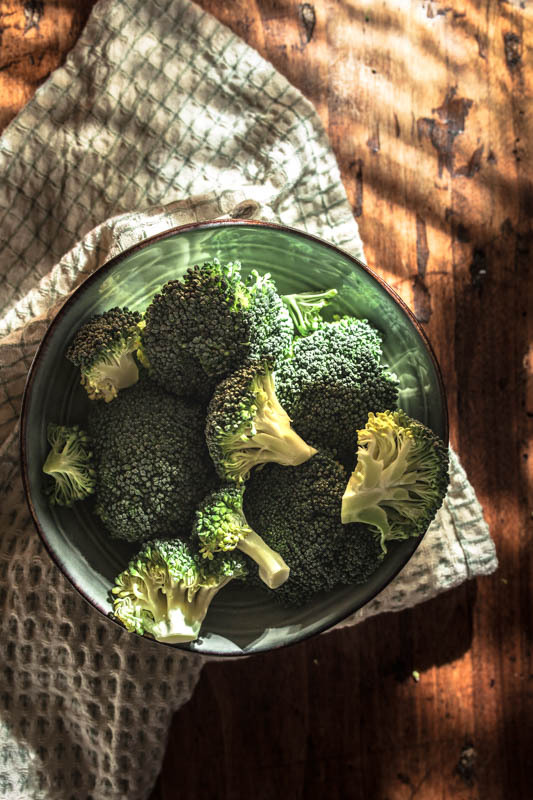 Most of the vitamins, colour and bite are preserved, while lots of nutrients go lost if you cook your veggies in water. Oh, by the way, I had a lot of fun making the mood photos for this post. 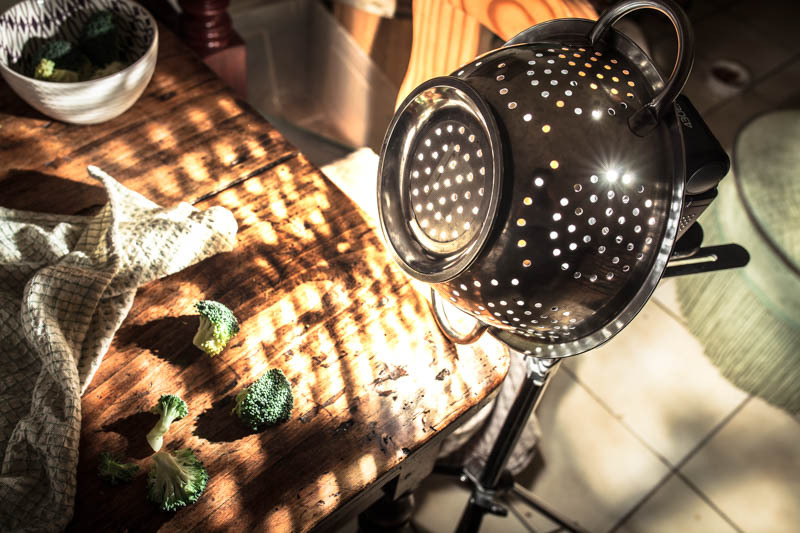 The protagonist of this post, the kitchen strainer, also served as a light shaper for a more creative outcome. Hi – I’m definitely going to try this, my kitchen is bigger than yours sounds but it’s still another thing to store away or clutter the worktop with…. Your pictures are also beautiful btw.